With the maturity of 3D technology, it becomes possible to watch 3D movies at 3D home theater. Insert the 3D Blu-ray disc to 3D Blu-ray Player, then you can wear your 3D glasses and enjoy movies with 3D effect on large TV screen. Plus, more and more youngers tend to watch 3D movies with VR Headsets due to their small size for easy carry. You can enjoying 3D movies from smartphone with VR headsets on the go. However, for Blu-ray disc owners, you're limited to view 3D Blu-ray on such devices because they lack Blu-ray drive. What's more, commercial Blu-ray discs all contain various copy protection and region restrictions. Therefore, to play 3D Blu-ray freely, it is essential for us to rip 3D Blu-ray disc to 3D digital video files. When we talking about ripping 3D Blu-ray disc, keeping the 3D effect is the most important. So a normal Blu-ray Ripper software perhaps can't fulfill our need. We need a full-featured 3D Blu-ray ripper, which not only can successfully get rid of all Blu-ray protections, but also freely convert 3D Blu-ray to various 3D video files for playback on portable 3D devices. 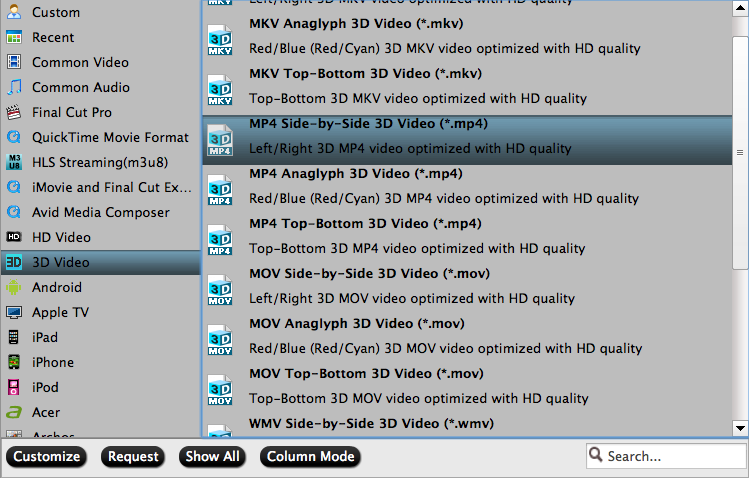 There is no doubt that Pavtube ByteCopy for Mac is the best 3D Blu-ray ripper you are looking for. Next I'd like to explain to you why it is the best. Pavtube ByteCopy for Mac won't let you down ever. It is a comprehensive Blu-ray and DVD ripping application to rip Blu-ray disc, BDMV folder, Blu-ray ISO files, DVD disc, Video_TS folder, DVD IFO and ISO files to MP4, MOV, MKV, AVI, M4V and any other video and audio formats you like on Mac OS. It can remove Blu-ray and DVD copy protection without any help of third-party tool and then extract the main title from Blu-ray and DVD, or clone Blu-ray and DVD contents with original structure in 1:1 without any quality loss including all audio streams, subtitle tracks and chapter info. Besides copy Blu-ray and DVD to digital video files, you can also personalize your Blu-ray movie with customized adjustments, such as adjust video codec, video bitrate, display ratio, frame rate and other settings, trimming part of whole movie, cropping black bars, inserting SRT subtitles, adding watermarks and special video effects. Before generate your own movie, you even can choose subtitles/audio track freely with one click. This full-featured 3D Blu-ray ripper also provides an equivalent version for Windows users: Pavtube ByteCopy. 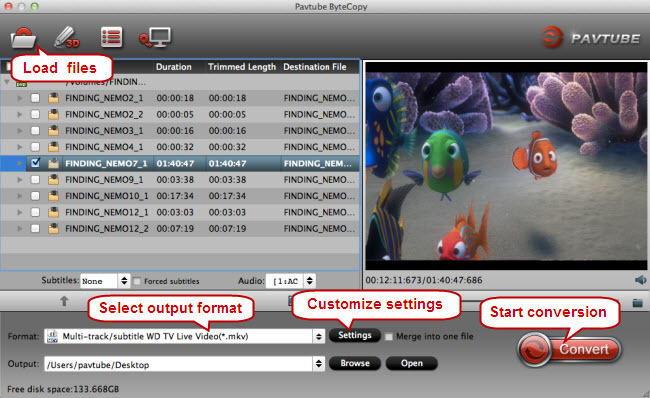 Why Choose Pavtube ByteCopy for Mac as the best 3D Blu-ray ripper for macOS? Rip and convert any 3D Blu-ray: Remove the newest encryption and region code from 3D Blu-ray disc, so that any 3D Blu-ray content can be extracted. 3D Effect Retained: As a powerful 3D Blu-ray ripper, it can copy 3D Blu-ray keeping 3D effect. This is the most essential requirement. Many 3D Blu-ray Ripper can copy 3D Blu-ray discs but lose the true 3D. Output various 3D modes: Allow users to choose 3D mode such as Side by Side, Top and Bottom and Anaglyph. Output various 3D formats:　Rip 3D Blu-ray to movies in 3D MKV, 3D MP4, 3D AVI, 3D WMV, 3D MOV, etc. for various 3D devices. Edit and Customize with Absolute Freedom: Not only a common 3D Blu-ray ripper, but also a powerful video editor that allows you to create a more vivid 3D movie. Intuitive interface: All options can be easily find on its main interface. Even newbies can use this full-featured 3D Blu-ray ripper to quickly complete task without any tutorial. Quick Speed: Nobody want to cost too much time on 3D Blu-ray ripping process and wait for a long time around computer. You will be deeply impressed by its super fast speed. Pavtube ByteCopy for Mac makes full use of NVIDIA CUDA and AMD APP acceleration technologies with H.264 and H.265 encoding. Mac Compatibility: Be fully compatible all macOS system including the latest macOS High Sierra. It also supports macOS Sierra, Mac OS X 10.11 El Capitan, Mac OS X 10.10 Yosemite, 10.9 Mavericks, etc well. After getting the best 3D Blu-ray ripper for Mac OS, you may be curious about how to rip 3D Blu-ray with 3D effect retained on Mac. Next is a quick guide to help you get a better understand of this 3D Blu-ray ripper for Mac OS. Click "File">"Load from Disc" button to import the 3D Blu-ray disc. After few seconds, it will be imported successfully and you can preview the whole movie in the preview window. 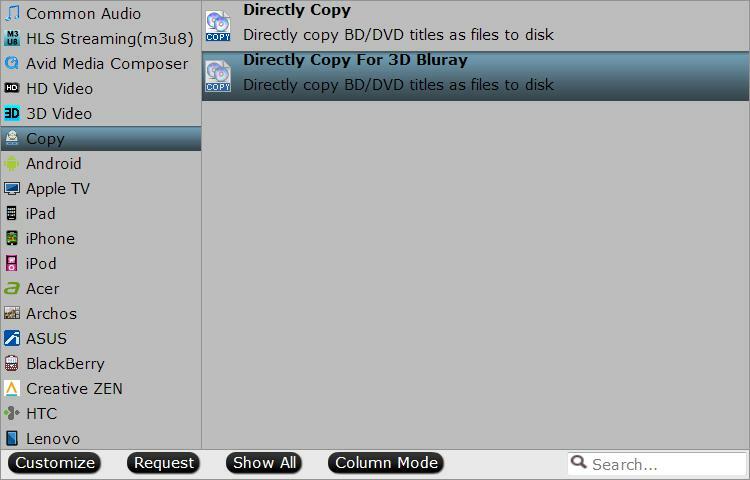 Now go to "Format" menu to select "Copy" > "Directly Copy" to copy the .m2ts files only which contains the main movie on your 3D Blu-ray disc. Finally, click "Convert" button to start copy the main movie of 3D Blu-ray. When the copying work is done, you are able to click "Open" button to get the output .m2ts files without any other extra contents. Launch the 3D Blu-ray ripper on your computer, insert your 3D Blu-ray disc into an external Blu-ray drive that has been plugged into the computer. Click "File" > "Load from disc" to add Blu-ray disc to the ripper. The main title of 3D Blu-ray video is automatically checked and you can preview it on the preview window. 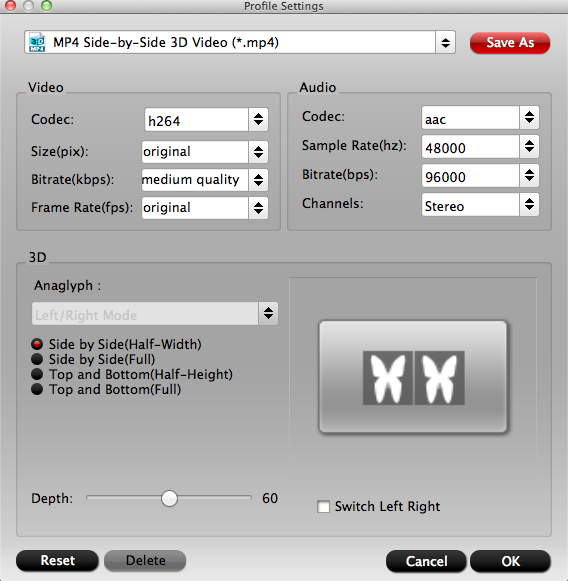 Click Format and select "MP4 Side-by-Side 3D Video(*.mp4)" under 3D Video. In general, MP4 is a well-accepted file format for TV, media players or Plex and keep up the video quality. Of course, 3D video in MKV, 3D video in AVI, etc. are supported as well. You can configure video and audio parameter to compatible with your 3D devices. You also can choose Full SBS or Half SBS in "Settings". Hit the "Convert" button under "Preview" window to start the 3D Blu-ray to 3D video conversion process. Now, after extracting a 3D video file from 3D Blu-ray disc with the full-featured 3D Blu-ray ripper, you will get various chance to view your 3D Blu-ray movies. For example, you can freely play 3D Blu-ray movies on PS VR, HTC Vive, Samsung Gear VR, etc. You can also backup your 3D Blu-ray to NAS, Plex, Chromecast to stream to 3D TV, Apple TV, etc.